#NZLEAD PREVIEW: Was your sphincter tightened by #HRINZCONF? There are different expressions for a sense of urgency and pressure associated with doing things in a radically different, or challenging to obtain way. Whatever the term, the metaphor of ‘Friction or Flow? Making the boat go faster’, used as the tag line for the recent HRINZ conference, should also imply a change or re-invigoration of HR practices in a way that is challenging us to improve. Or are we just asking the question: flow or friction? But actually doing nothing about it. I, personally, was unable to attend the conference due to work commitments. However, we did have #NZLEAD tweeps on the ground and this is a continuation of their discussions at the conference – let’s share the learning. So, if you were at the conference, I encourage you to take part in this discussion. If you were not at the conference, please ask questions and join the debate to learn what you can. 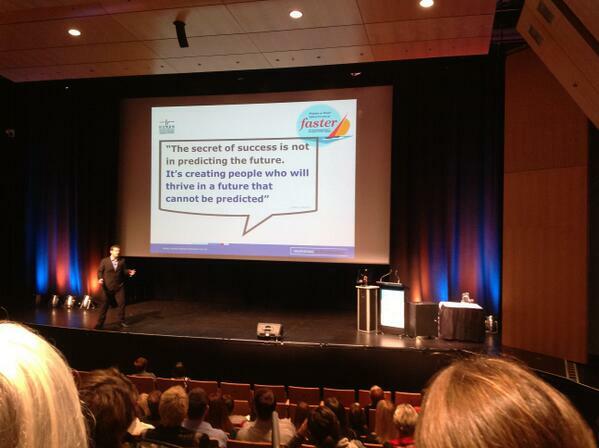 I also encourage you to have a look at the tweet stream from #HRINZCONF. Q1) What things did you learn that made you rethink the way you do HR? Q2) What will you be doing differently as a result of what you learnt? Why? Q3) Are we really making the boat go faster or rehashing the same old topics? Why? Q4) How much are we preparing HR to thrive in a future that cannot be predicted? Picture from the @HRINZ account that really sums up the last question. We’re pleased to bring you this special offer for #RHUBNZ. Hope to see you there as #NZLEAD will also be tweeting from the event. Communication becomes the core of everything we do. In order to be a successful leader we need to be a good communicator and the same goes for having a successful crisis and contingency plan. Businesses can have the most comprehensive and detailed plans for when a crisis hits, but if the leader is not a good communicator the plan will quickly fall to the wayside. At a time of a crisis it is important that your business leaders stand up and help employees through it providing a human element as well as the technical aspects. HR can provide advice and support to leaders during a crisis to ensure they are including the human element and providing good support to their employees. Earthquakes don’t happen everywhere, but it doesn’t mean a crisis can’t hit where you are. It is important that no matter where we are our businesses have a plan in place incase something happens. Be prepared and be prepared to help your leaders step in a time of chaos and need. HR aren’t the face of the organisation or the emotional rock of the organisation (as said by HR Tinker) but we are the department that helps managers manage relationships and therefore we are in a unique position to help them be the best they can be in a time of need.